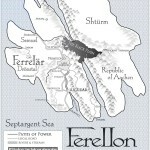 Here the Ferellon Gazetteer introduces you to the island’s society, culture, and climate. This is a wonderful place to live, love, and learn to grow. Though things seem very different, on the surface, you’ll find it to be very comfortable. Money is measured by cut lengths of standard cord. This cord is extruded gold wire rolled through extremely intricate embossing rollers at the Royal Mint. The resulting gold cord is distributed as sealed spools to Royal Coil Cutting Parcelers. Parcelers use Inspected Coil Cutters to cut the coil to an accuracy of a thousandth of a nick. Large sums of money were paid with spools plus measured lengths of cord. Normal business used coins made of stamped coils of cord. These were standardized cuts that were tightly coiled into a debossed circular hole and sealed by locking the coil into place with the stamp, which listed the length of cord in the coil. An official stamp would only hold exactly the correct length. If shorted, the coil would have a notch in the edge. The resulting coins showed the coiled lines of gold on the back with an official seal on the front. Businesses commonly had their own official stamps with the royal imprimatur on the center of the bottom edge of the design to indicate their official size in tenths of a nick. Beat: A little over a tenth of a second. 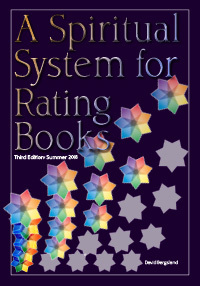 Sections: Approximately a third of a season. Every Season has three parts: Early which begins 30 days before solstice, equinox or midsummer; the actual season of 31 days, which starts at solstice, equinox or midsummer; and Late which varies. Late Winter is 30 days, Late Sowing is 31, Late Growing is 31, and Late Harvest is 30 days. Calendar: All winters are counted from the death of Ansélan which traditionally happened on Winter Solstice in the Year of Our Lord. Years after that date are numbered with an AD suffix (which stands for Ansélan’s Dominion). Years before that date use a BA suffix for Before Ansélan. Ferrelär: Official years in Ferrelär begin with Coronation of Cyril Fendrale on Summer 1. Official years are written with an BC suffix for Before Cyril or an AC for After Cyril. These were Ferellon, Pedalumina, Marlyn, Qantel, Krobashan, Frengtar, and the Isles. But good maps were hard to find. At the time of this tale, self-determination is running rampant. There is a huge worldwide movement toward self-rule through representative government. As a result there are now 27 separate nations—though that still includes a few kingdoms. The glory of Pedalumina is long gone, with the present government almost nonexistent as a coherent national force. Pedalem, its capital, is now ancient and tawdry. The current Emperor is more a tourist attraction than a real ruler. The empire has been taken over by roaming bands of bandits who build rapidly changing confederacies with the new warlords dominant for a few decades. There has been no effective, righteous government since Emperor Qardashian and the Imperial Priesthood ordered the sacrifice of Ansélan over two thousand winters ago. The other five kingdoms are mere memories told in epic poems. The world is now constantly at war. Ferellon’s protection has been its relatively isolated geographic position on the northeast corner of the Septargent Sea. In addition, until the rise of Primate Roark, Ferrelär Kings have been basically benevolent with Ansélanity the unofficial state religion..
Krobashan, the kingdom that separates Ferellon from Pedalumina, is being violently torn by civil war. At this point, none but God knows which forces will win out. In fact, it is only by the grace of God that neither Ferellon nor Pedalumina is in a position to have imperialistic ambition—for Krobashan is easy pickings. This is a loose confederation of clans and chieftains. There is much predatory behavior and raiding of each other as well as Aachen. 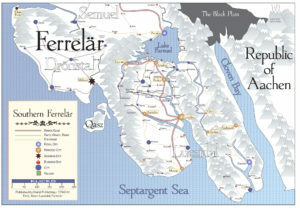 The Black Plain, the central mountain ranges, and the two deep fjords tend to protect Ferrelär. The northern sea is effectively blocked by the near constant icebergs and the dangerous storms that blow regularly out of the northeast. However, there has been increasing pressure to organize a major assault on what they consider the Golden Land, to the west. So far, Ferrelär has ignored these threats as beneath their dignity. This is a self-ruled, representative government of semiautonomous counties. The focus of the entire nation is on technological advance. Their main focus is on finding a cost-effective substitute for andross, so they can have Power also. 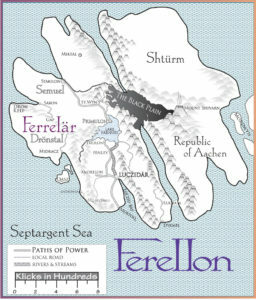 There are three Ferrelärian manors: Semuel, Dronstäl, and Luczidal. This is an Ansélan kingdom, though most of this has degenerated into mere religion. Semancza’s stronghold: The moderating effects of the warm ocean current flowing toward Drönstal have two major effects. First, there is a great deal of rain and water. 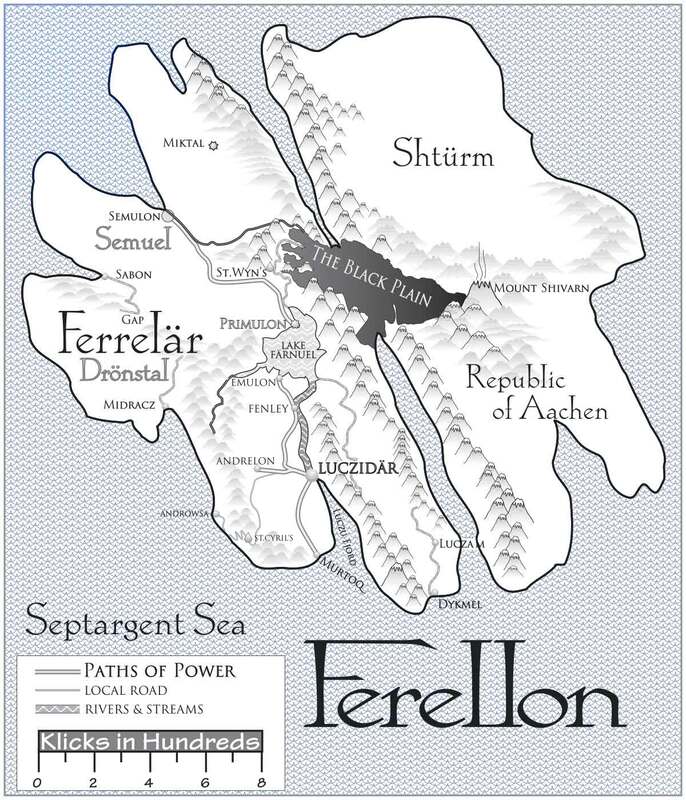 Second, this is the only region of Ferellon that rarely experiences frost. When it does frost, it is only in the highlands near the Gap to Semuel. As a result, this region produces a great deal of fruit and vegetables which are shipped out of the capital, Midracz to all of the Seven Kingdoms. This region enables Ferrelèr to have fresh fruit and vegetables year-round. In addition, the current provides Drönstal with an exceedingly rich fishing industry. Much of the fish is shipped to Murtoq and Dykmel for smoking and drying. This is a stereotypical temperate region focused on grain production and livestock. The entire north ern reaches above Semulon are used for grazing. The nomads who raise the livestock are known as Gremyul. These people have roamed the northern ranges since well before the start of the Three Kingdoms. The huge plain between Semulon, Primulon, and Sabon is entirely given to the raising of grain. The main shipping port is Sabon, since Semulon’s excellent harbor is often blocked by ice in the winter. The Road of Power to Semulon is primarily used for shipping the grain and flour to the richer southern regions below the Lake. The major flour mills are run by the River Farwell North 60 klicks north of Primulon. We begin in Luczidal, the most populous and richest of the three. Much of this is due to the discovery of Power. This energy source produces beams of energy which can be harnessed with dish receptors and conversion transformers running direct current motors. The Crown controlled all Power through its Assumption of Power forty winters ago, They had delegated some of that control to the Church. As a result, today most of society’s benefits were only available to the Church and through Patronage of the Crown. A person had to sign the Pact and take the Oath to gain access to use of the Power. Almost everyone in the Powered cities had done so. There caused several problems. First, only the rich could afford the Pact. It cost 50 spool—over fifteen years income for the people. Second, it had become an inherited right. As a result, Ferrelär is divided into two major classes, the Powered and the people. East Luczidal is the disputed land east of the Shtornal Range. Over the years it has changed hands regularly between Ferrelär and Aachen. Currently a part of Ferrelär, it has always been a hotbed of rebellion. 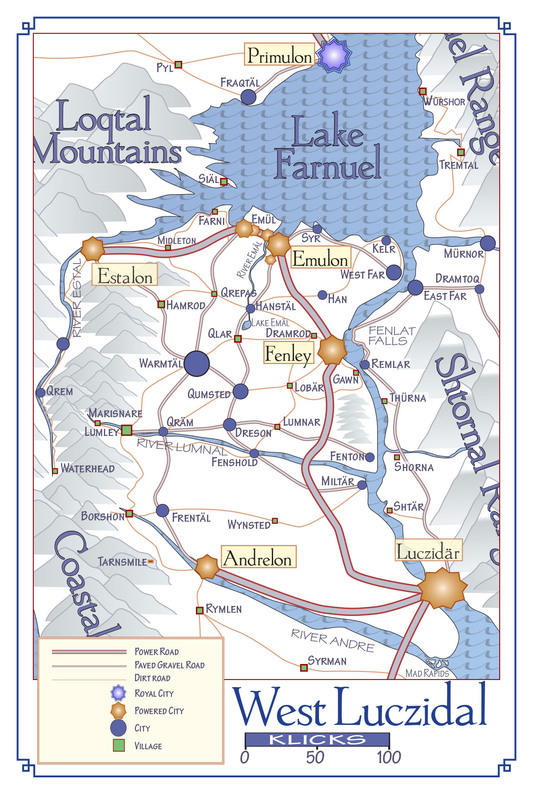 The major sources of income are mines in both the Shtornal and Farnuel Ranges which provide the only sources of gold and andross in the kingdom. Plus there are large deposits of iron, silver and the best nutwood forests on Ferellon. It is a land rich in natural resources and greed. 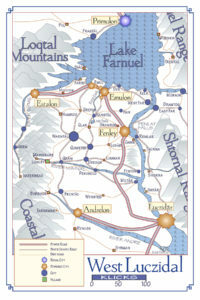 West Luczidal is the center of the world for the Ansélan religion and almost the entire world of Powered sophisticates. The source of Power is found here in the three rivers that are harnessed as they enter Lake Farnuel. The River Farwell, on the north, coming down from the Black Plain; the River Estal, on the west, flowing from the rain forests of the Adrael Range to the west; and the River Mürnor, on the east, flowing down from the andross mines in the Shtornal. All Roads of Power are found here except for the long run north from Primulon to Semulon, which was built by King Fortinal in 1237–42 AC to avoid the intrigue of the Luczidèrian court which absolutely dominated the 13th century. Andross is required for power production, and it is very rare. This is a loosely organized grouping of the Ansélan Crafts and their support people. Craft is a term for anyone involved with design, creation, and production of materials for society as a whole. In a civilization without assembly lines or mass production, everything is made by people of skill. Guild walls were erected to contain the Crafts, their strangeness, and the often disruptive Rovers. There are no merchants here. They are not allowed to set up shops outside of the market and the market within the Guild walls is quite limited. Merchants come to the guild to purchase products to distribute elsewhere. A large portion of Craft workshops are not even open to the public except on very limited schedules. There are leather workers; smiths; tool makers; millers of metal, wood, & flour; armorers; woodworkers; carvers of wood & stone; cabinetmakers; weavers; cord & rope makers; tailors & seamstresses; glass makers & window makers; stained glass producers and designers, wagon & carriage makers; painters; papermakers; printers; sign makers, and the list goes on. The creatives are scattered throughout the Guild. Most are envied, mistrusted, and pushed aside. Many are strange, self-focused, and The jealousy focused against a creative is intense. They are largely Known. The creative gift is so much a part of the image of God that it can not really be exercised without His help and gifting. Creativity outside the Known tends to be harsh, exciting, titillating, or worse. In an Ansélan society, unKnown creative output has little place. It’s too ugly, harsh, and sinful. However, this trash is becoming common in the larger cities. Primate Roark decidedly discouraged any direct prayer to Ansél. In fact, he demanded the much more formal appellation of Ansélän. His doctrine was that the Guardian Spirit, or Larzu, was still active in the Church, but it was revealed only through the Ordained, the Traditions, and The Tale compiled by Farwyn and his fellow apostles over fifty generations ago. Henglin Roark began blatantly killing the Known, when he could find them. For many seasons now, the Known had been blamed for many things formerly ascribed to the criminally insane. ` The Known were outside both. The Pact to be signed and the Oath to be said were anathema to them. Pact procurement had become increasingly expensive and now cost over 50 spool of cord. This morning it looked quite ominous. An evening rain had darkened the normally golden stone city center into a dull brown—plus he was on the shadow side. This morning, the normally glowing city was a dark heap of brownstone mounding up to the gleaming gold leaf flower of roofs crowning the St. Farwyn complex. The seat of the Primate. A huge complex of buildings surrounded by a fortified wall standing 80 spans tall. But Ansélanism had gone far from its roots. Henglin Roark had done more damage recently, but the Church had long forgotten the center of the Tale—that the real believer was Known by his trust. In fact, the trusting broken body on the Rock above the altar in the front of St. Farwyn’s had been replaced by a huge image of Farwym looking down longingly at the Rock (which, of course, was now carved out of a pure faceted crystal of Romulite that glowed deep purple and emanated a shaft of pure white light shooting straight up out of the point of the Rock to illuminate the old man’s face). The department of the church charged with the maintenance of family trees, inheritance logs, and titles earned. In reality, they were consumed with power and manufactured lineage to suit the purposes of the Primate. Allegedly because of the scarcity of andross (but primarily to keep control over the citizens) access to Power was greatly restricted. The only places it was commonplace was in the large cities: Primulon, Luczidär, Andrelon, Fenley, Emulon, and Estalon. There was a little access in smaller cities surrounding the Powered cities, like Emül. They were all in Ferrelär except for the capital of Semuel, Semulon, in the far north. Almost everyone in the Powered cities has signed the Pact and said the Oath. There are several problems. First, only the rich can afford the Pact anymore. It cost 50 spool the last time I heard. That’s over fifteen years income for most people. Second, it has become an inherited right. As a result, Ferrelär has been divided into two major classes, the Powered and the people. Only the Powered could use the Power buses and flyers. The official minted passes are simply not available to the people. Third, and most significant, is the Oath. There is no way a true believer could say the Oath. A person had to promise to serve the King as God’s sole ruler and the Primate as God’s voice to the Seven Kingdoms. The Primate hasn’t spoken for God in over two hundred winters. Actually, he doesn’t even know God. To say the Oath a believer would have to lie—and that’s forbidden.